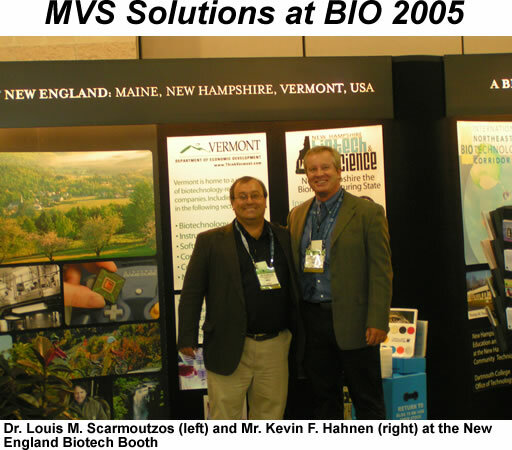 (PORTSMOUTH, NH) July 2005- MVS Solutions, Inc. represented New England biotech at the recent BIO 2005 Convention in Philadelphia. BIO 2005 is the world's largest biotechnology gathering. The BIO 2005 Convention was a resounding success. Over 1,500 companies including most U.S. states (48) and many countries (61 nations) provided exhibits or pavilions at the convention. With approximately 19,000 attendees, the momentum of BIO 2005 is expected to translate into new business opportunities and new breakthroughs for biotechnology. According to Dr. Louis M. Scarmoutzos, President & Founder of MVS Solutions, "You would be hard pressed today to find any place on the planet that does not provide economic incentives to locate your biotech interest in their area. The promise of biotechnology and its economic rewards is still very alluring." Information regarding corporate, technology and new enterprise development in the biotech and life sciences industry is available from MVS Solutions Inc. by calling (617) 283-2182 or online at www.mvssolutions.com and at www.mvssolutions.biz. MVS Solutions, Inc. is a corporate and technology development company focused on the biotech, chemistry, life sciences, pharmaceutical, medical device and related industries. BIO (Biotechnology Industry Organization) represents more than 1,100 biotechnology companies, academic institutions, state biotechnology centers and related organizations in all 50 U.S. states and 31 other nations. BIO members are involved in the research and development of health-care, agricultural, industrial and environmental biotechnology products. Additional information about BIO can be found at www.bio.org. Information regarding MVS Solutions and their products and services can be found at www.mvssolutions.com and at www.mvssolutions.biz. MVS Solutions, Inc. has offices in the Metro Boston Massachusetts and New Hampshire Area.